I could have sworn I had written a post for the eleventh, but apparently not. I think I spent it frantically knitting the rainbow hoodie, which is written to be rather long, so took longer than expected (and why do hoods always take more time to knit than I think they should?!). Some slightly meh colours (read too orange for my liking) from the Opal and Paintbox Yarns advent calendars, but the blue rainbow yarn is beautiful, and I'm very much looking forward to adding it to the blanket. Monday was the crazy day in the lead up to Christmas with the nursery party and the school show. I was also meant to be at my work Christmas dinner, but decided from the start that the day would be too busy if I tried to get to that as well! I also managed to whizz through some sewing of last minute gifts to people I was seeing at my Monday night knitting group. Phew! I did get to have a nice relaxing knit in the pub in the evening though, which was lovely, and I managed to get a bit more knitting done on my sock yarn blanket, so am not quite so far behind. And I finished the rainbow hoodie, just in time to pass on to its recipient on Monday morning! So neon you can see it through the bag! A much quieter day: a morning to myself to get on with some non-festive pattern writing (though the deadline is Christmas day!) and start knitting a sample. And coffee in peace! 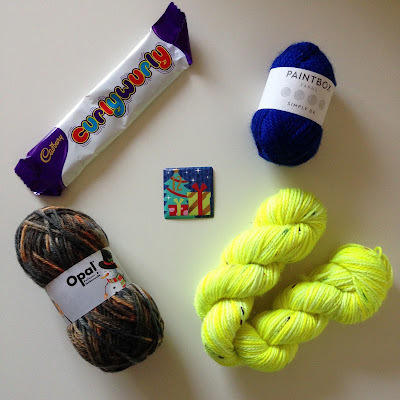 I loved all the colours from the advent calendars - isn't the festive yarn from Felt Fusion beautiful? I won it in a competition in the summer and have been saving it for Christmas. And just for Sara Roberts, here are all my Paintbox yarns colourways in one photo. I hadn't realised quite what an assortment I have (Sara, do yours look better slung into a pile - I tried laying mine out in order and they looked rather drab), and still haven't decided what I'm going to make from them, but I'm starting to think that I'm going to wait until they're all out of the box and make something wonderfully coordinated for next Christmas. My final child-free day before Christmas, so I have spent this morning frantically trying to finish writing the Christmas cards written and get anything that needs to go in the post wrapped (largely unsuccessfully, fortunately our Post Office is in a shop and is open until late). I have also stitched the final two Christmas presents that needed doing, so I'm feeling pretty on top of things at the minute. Today's advent calendar colours are lovely. Nicely coordinated! I added the Paintbox Yarns ball to my Advent Kilner jar, and might have to find an alternative display system for the yarn, the jar is full! What's everyone else been up to over the past few days? Is all the Christmas prep done? Oh, a special mensh! I have just taken a photo of mine which I will attempt to share with you (maybe via Rav?). I found that a pile looks better than a line, and I agree, mine are rather pastel-y and beige, especially as I'm in serious need of yellow. It's odd because the colours they do in the range look fairly bright! Ten to go...*please* no more muted tones!! You're welcome! I'd love to see the picture, I'm not sure you can send pictures via Ravelry though, try emailing it to me, vikkibirddesigns @ gmail.com. There do seem to be a lot of neutrals! Hope you get more bright shades soon.